French edition of Thomas Hutchins "Topographical Description of the Ohio Country"
Thomas Atkin, Plot of Springs Property [with:] Plan of Fauquier White Sulphur Springs with proposed Building Lots. New Baltimore, Fauquier Co., Virginia, ca. 1830s-1850s. Two manuscript plats in ink and watercolor, 17 ¾”h x 22 ¾”w and 16 ½”h x 17 ¾”w at sheet edge respectively. Large plat with some soiling, staining, and restoration to wear along edges, as well as two long, horizontal tears mended, with residual cello tape stains from old repairs still visible. Smaller plat with soiling and staining, including inactive mildew, as well as restoration to significant areas of loss, including some loss of image. Both plats lined on verso. 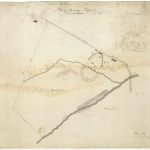 A remarkable survival, being a pair of antebellum manuscript plans for the hotel and grounds of the famed Fauquier White Sulphur Springs resort. The resort was located some 50 miles west of Washington, D.C. and just a few miles south of Warrenton, Fauquier County, Virginia, and should not be confused with the White Sulphur Springs resort in Greenbrier County in present-day West Virginia. It was one of the more prominent of the many mineral water resorts located in and around the Blue Ridge Mountains, which attracted droves of southerners seeking to take advantage of their supposed medicinal properties. “In the late 1700’s, Captain Hancock Lee built a lodge near the sulphur water spring on the Rappahannock River. The location of the Springs was fortunate, as it was just a one-day stage coach ride from Washington, D.C., making it accessible to the entire Atlantic seaboard which was already served by railroads. Southern plantation owners would spend a month or two each summer with their families at “The Springs.” The fame of the sulphur waters and their miraculous healing properties for all sorts of ailments spread and people began to flock to the Springs. 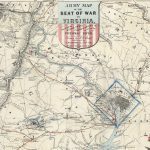 The resort had the misfortune of being located in one of the most active theatres of the Civil War, and it was largely destroyed by fighting during the Summer of 1862. It lay in ruins for years, until being rebuilt on a new plan in the late 1870s and early 1880s. Today the property is operated as the Fauquier Springs Country Club. 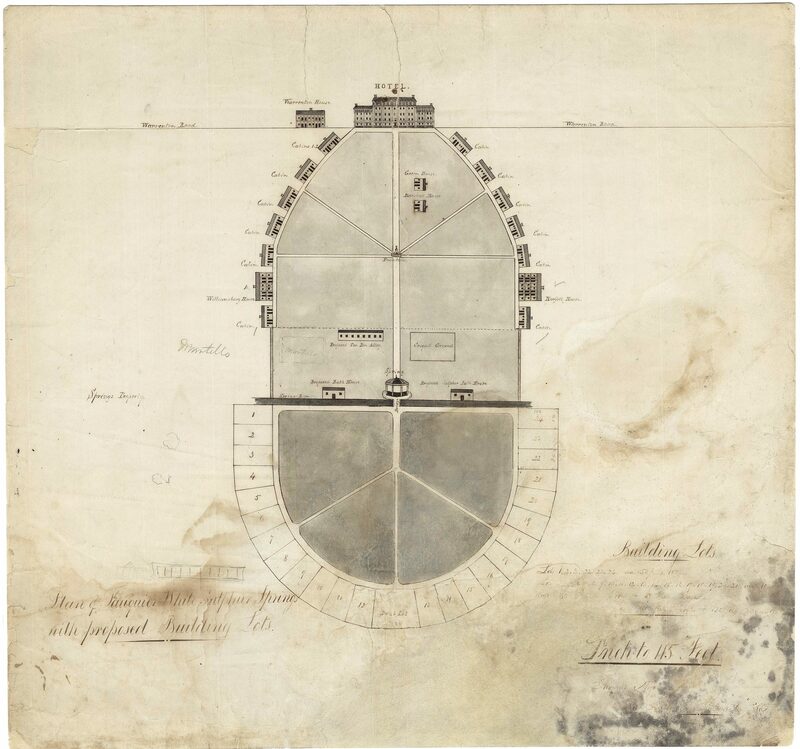 Offered here are two antebellum plans of the resort, both in manuscript. 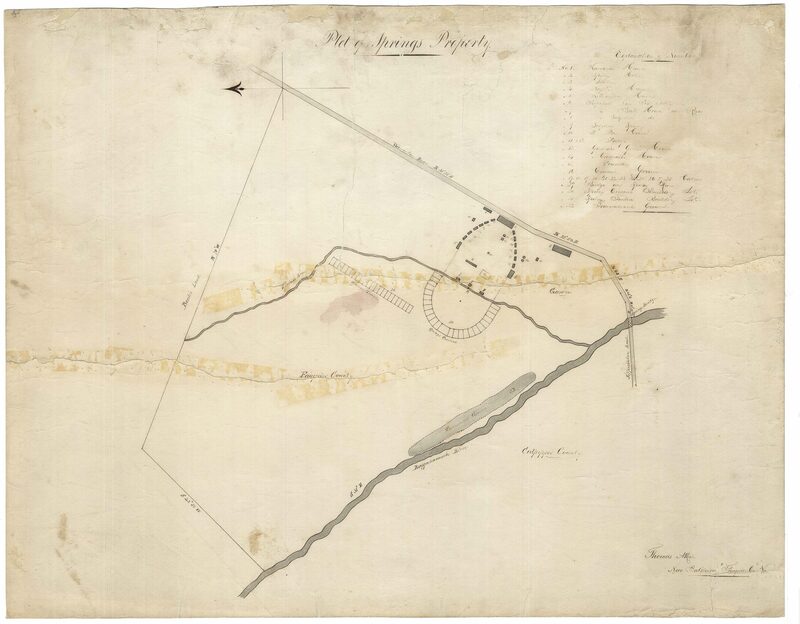 The larger depicts the holdings of the Fauquier White Sulphur Springs Company on land bounded by the Rapahannock River on the southwest and the Warrenton Road on the southeast. Superimposed on this is a plan of the resort, with a numeric key identifying 32 structures, including the main hotel and the distinctive wings of cabins fanning out to either side. Facing the hotel from across Spring run are two groups of parcels, “Springs Crescent” and “Springs Terrace,” apparently laid out and ready for sale. The smaller manuscript is a beautifully-rendered plan of the resort itself, executed at a much larger scale. 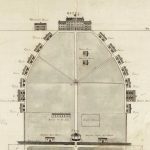 It apparently depicts every structure on the property, both extant and proposed, in exquisitely-detailed perspective view. One gets the impression that every window, door and chimney is represented, as well as the columns supporting the grand porticos of the Hotel and Warrenton House. 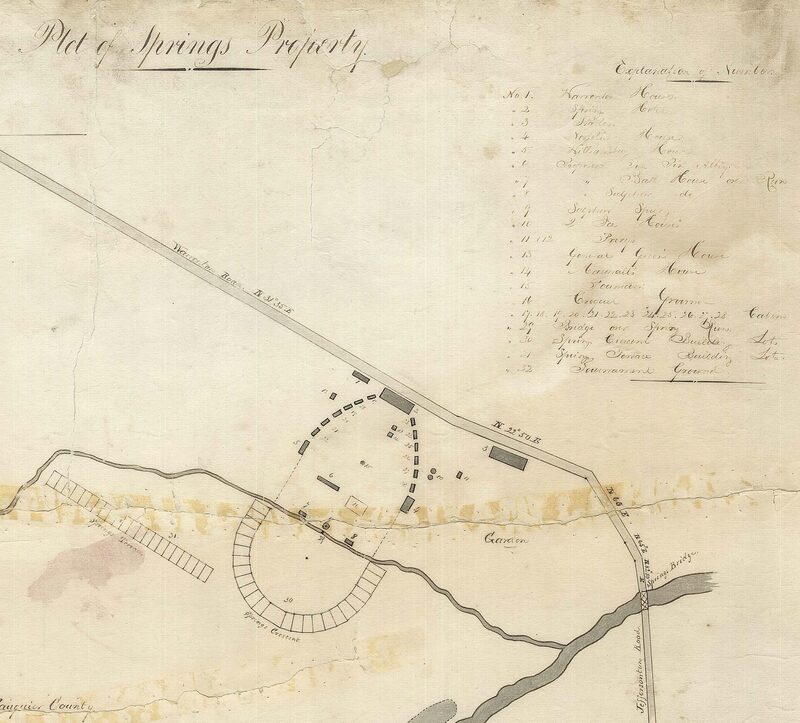 As on the other plan, the 24 building lots of the Springs Crescent are shown facing the Hotel from across Spring Run, their dimensions given in notes at lower right. I have found no evidence that these lots, or those of the Springs Terrace, were ever developed prior to the War. 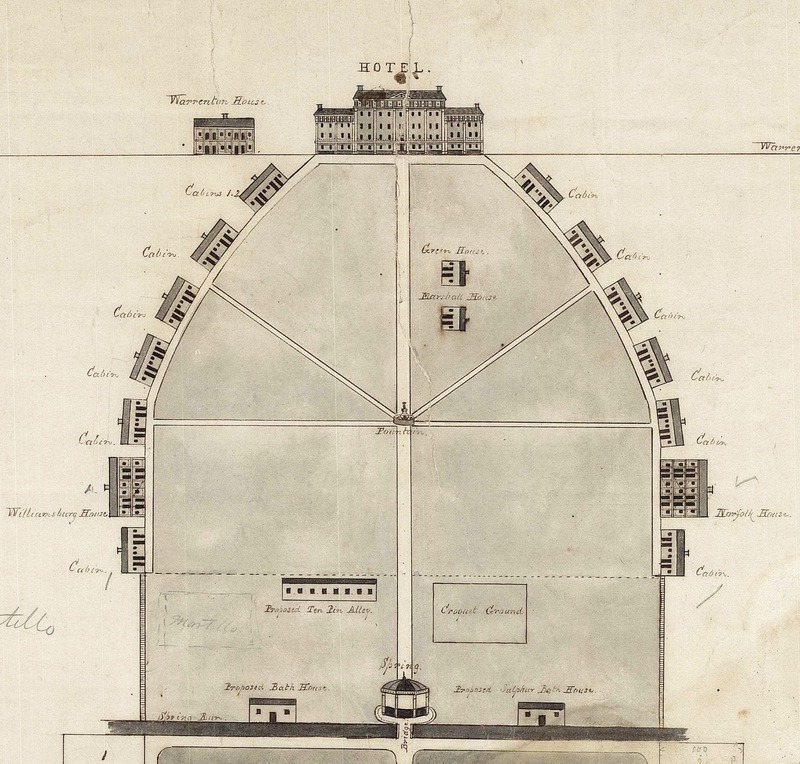 Compare these plans to, for example, Edward Beyer’s 1857 view of the resort, which while largely consistent with the plans, shows no sign of additional development. 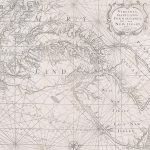 Due to the ravages of climate and war, antebellum manuscript maps and plans of Virginia subjects are rarely encountered. This pair of expertly-drawn plans of an iconic resort destination is thus a remarkable survival, with great documentary value and real research potential. For further background, see John J. Moorman, The Virginia Springs: Comprising an Account of All the Principal Mineral Springs of Virginia. 2nded. (Richmond: J.W. Randolph, 1854), pp. 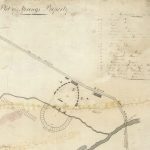 246-249; and Janet Pearson, “Fauquier White Sulphur Springs,” at Taking the Waters: 19thCentury Medicinal Springs of Virginia (on line at the web site of the Claude Moore Health Sciences Library of the University of Virginia). 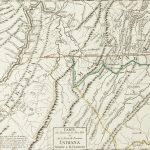 For an interesting take on the cultural significance of the Virginia springs, see Lauren E. LaFauci, “Taking the (southern) waters: science, slavery, and nationalism at the Virginia springs,” Anthropology & Medicine, vol. 18, no. 1 (April 2011), pp. 7-22.